The dog food industry is booming, and while that's a great thing for pet owners, I know that I can't be the only one feeling overwhelmed by the number of choices on the market. Finding the right food has quickly become a nightmare. There are more brands on the market than you can reasonably count, and the product variations are mesmerizing – grain-fee, reduced fat, limited ingredients, exotic protein, and so on. Fear not; I've got the answer! We’re here to simplify matters with our unbiased guides to the best and worst pet food brands out there. 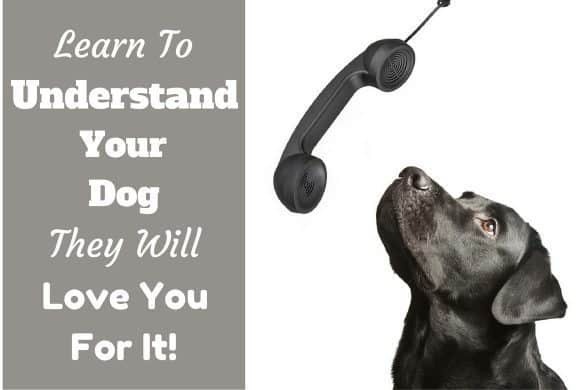 You just sit back, take it all in, and then decide what’s right for you and your dog. Here’s our look at Wellness Dog Food reviews, ingredient quality, recall history, company info and more. What Dogs Is Wellness For or Suited to? Wellness offers a wide variety of premium-grade wet and dry dog food. 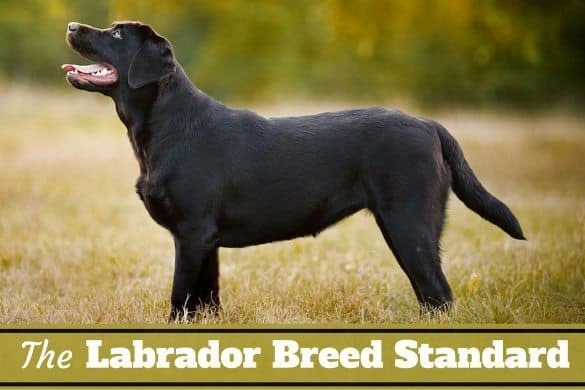 They have selections suitable for dogs of many different sizes and stages in life, as well as for varying nutritional and allergy requirements. A wide range of size options is available to suit your buying habits. This is not the most expensive brand on the market, but it is far from being a bargain brand. Wellness projects a very good corporate image with attractive and comprehensive websites that include a consumer feedback feature. They also have a YouTube channel with a lot of interesting content. After researching the company, one comes away with the feeling they can be trusted. They certainly seem to have a large group of brand adherents, and those who purchase their products seem highly satisfied far more often than not. We, like many others, do recommend this pet food. Who Makes Wellness Dog Food and Where is it Made? Wellness dog food is made by Wellpet LLC, an umbrella company headquartered near Boston, Massachusetts. The company sprang from an earlier dog biscuit manufacturer called Old Mother Hubbard, which itself began from a bakery founded in 1873. Wellness has existed as a brand since 1997. In addition to an extensive line of dog food, Wellness also sells a cat food line. Other Wellpet brands include Old Mother Hubbard, Holistic Select, Eagle Pack, and Sojo’s. Here’s a short video from the manufacturer discussing their manufacturing process, and commitment to quality food. The ingredients in Wellness CORE dry dog food are generally favorable, although there are a couple that may be worth singling out for further discussion. Deboned Turkey – Of course it’s always great to see meat so prominently featured on an ingredients list. Turkey is a great source of protein, is easily digested, and is lower in both fat and calories than chicken. Turkey Meal – More meat? Yes please! “Meal” is largely dehydrated, which makes it nutritionally concentrated. That’s a good thing. Chicken Meal – Keep that meat coming! Another good source of protein, and also economic to include. Note, however, that the prevalence of chicken in many dog foods has turned it into a relatively common allergen in the canine community. Tomato Pomace – To some, this is a controversial ingredient, partly because it’s a by-product of the tomato soup and juice industries. However, it can be a very good source of fiber, vitamins and nutrients. Ground Flaxseed – This is a very good source of omega-3 fatty acids, and it’s high in soluble fiber. Salmon Oil – Fish oils are a great addition for dogs; they’re full of omega-3 and omega-6, and are good for the skin, joints, and the cardiovascular system. Oh, and they’ve got plenty of vitamins, too, such as some Vitamin B supplement added in! Blueberries, Rosemary Extract, Green Tea Extract – All of these ingredients are terrific sources of anti-oxidants. Among their many benefits, antioxidants may reduce the likelihood of contacting certain cancers. Since cancer is the number one killer of dogs over 10-years-old, seeing them on the list can only be positive. Potatoes – There’s nothing really wrong with potatoes, but there’s nothing about them that makes them worth recommending, either. They provide carbs and starch, but little nutritional value. Potatoes are becoming a popular alternative to grains. Natural Chicken Flavor – This is a vague description of an ingredient that serves no purpose other than to “enhance” the flavor of the food. Given the amount of meat present (and the many unappetizing things dogs will readily chow down on), there seems little need for extra flavor. Not necessarily a bad ingredient, but not something we really like to see. Copper Sulfate – Dogs do require copper in their diet, and many dog food manufacturers add a copper supplement to their formulae. In its pure form, however, copper sulphate is an irritant and may actually be harmful. Though the quantities found in dog food are likely safe, it’s still an ingredient some may choose to avoid. Sodium Selenite – Although essential to the body, selenium is toxic when administered in large quantities. One study indicated that sodium selenite is actually even more toxic than natural selenium yeast. The quantities contained in dog food are likely safe, but issues have occurred in the past, making some pet owners leery of the ingredient. Is Canidae Dog Food Any good? 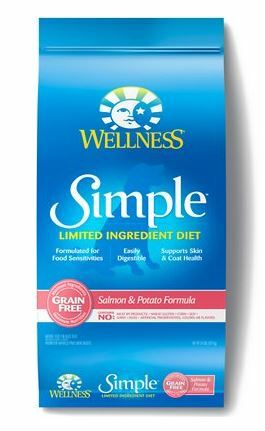 15lb, 30lb, and 5kg bags of Wellness Complete Health Super5Mix Large Breed Puppy with a Best By date of Jan. 9-11, 2013, were recalled due to the possibility of salmonella. All batches were tested for salmonella before shipping and tested negative. However, the food was made at a third-party facility linked to a salmonella contamination. Wellness issued a voluntary recall of the pet food as a precaution and has since stopped having food produced at that facility. 12lb bags of Wellness Small Breed Adult Health Dry Dog Food with a Best By date of Aug. 18, 2013, were recalled due to a possible moisture contamination. The issue appeared to pose no risk to dogs, but may have caused the batch to go moldy prematurely. Wellness offered replacement bags to anyone who bought from this production run. Both of these recalls appear to be minor incidents and were well handled by Wellpet. Neither incident should be any cause for concern to a potential buyer. Wellness uses a wide variety of protein sources in their pet food, sometimes on their own, and sometimes in combinations. These vary by formula line and include: Turkey, Chicken, Beef, Whitefish, Duck, Venison, Lamb, Salmon, Tuna, Cod, Herring. Many of Wellness’s offerings come blended with non-meat ingredients such as: Carrots, Pumpkin, Green Beans, Potato, Sweet Potatoes, Oatmeal, Broccoli, Spinach, Kale, Cranberries, Red Peppers, Brown Rice, Peas, Chickpeas, Flaxseed. ​Many grain-free options are also available. Puppies – Specific pet food formulas for puppies are available for small, standard and large breed dogs. Features vary by formula, but include DHA for brain development, targeted nutrients and smaller kibble for large breed pups. Many good options, but I lean towards grain-free blends. Adults – Many great options available; just pick your flavor preference! Seniors – Formulations for seniors are available in the standard and small breed categories. Grain-free is not available for a senior-specific diet. Active – Many good protein sources available for dogs that burn a few extra calories. Consider the Complete Health line to help support the immune system of a dog that gets out a lot, and aids with joint and bone wellness. Less active – Again, the Complete Health line may be beneficial. Try the Whitefish to help maintain the coat and keep fat levels down. Small breeds – Many varieties to choose from, both wet and dry. Wet foods seem to be favored by many small breeds, and Wellness offers a lot of choices, including a variety of single-serving meals. Fussy eaters – Wellness offers a very wide range of products, so with a little patience, it shouldn’t be hard to find a favorite. Dogs with allergies – Although there are limited options for exotic protein (a couple of venison and wild game products), the assortment of grain-free dog food and limited ingredient blends may provide a solution. Try a blend from the Simple line of foods. Overweight dogs – Reduced-fat pet foods are available in three product lines. I’d try the Complete Health Healthy Weight De-boned Chicken & Peas. Toy breeds – There is only one Toy breed formula available. It seems to be well formulated, but if your dog doesn’t like the blend of chicken, rice and peas, you’re out of luck. something else. 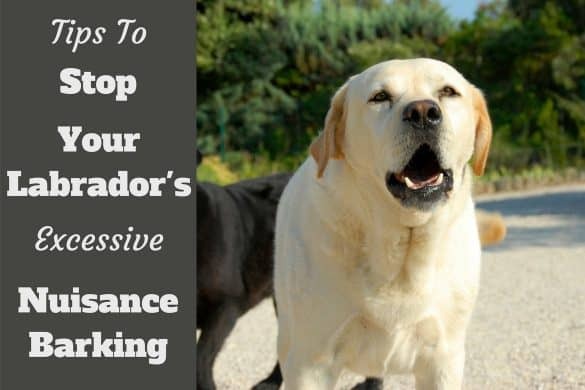 Working/Athletic dogs – Wellness does not offer a formula for high-performance dogs. If you have a racing or sled dog, or some other manner of competitive breed, you may need to look elsewhere. Pregnant dogs – Again, no specific formulation for dogs that are expecting or nursing. However, Wellness does make recommendations for serving selection and portions from its available foods. 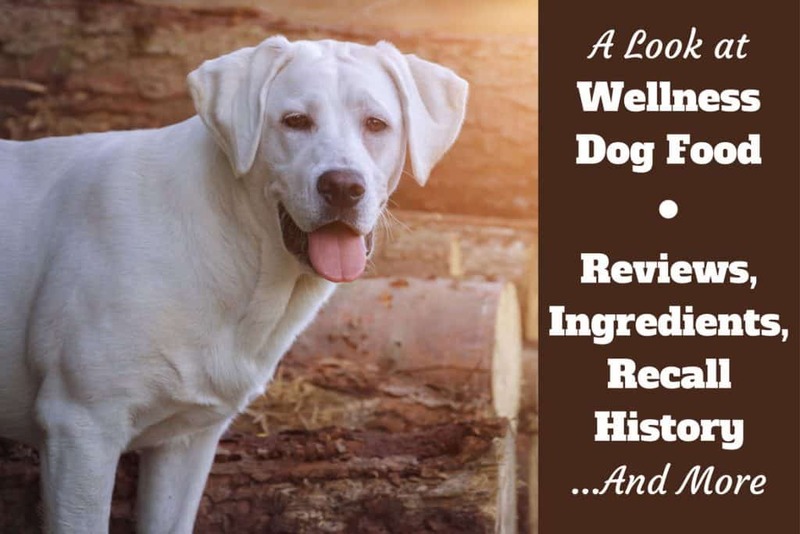 In the following section, we take a closer look at 3 of the most popular of Wellness dog foods offerings, discussing their overall quality and consider their pros and cons. This offering from the CORE line of products contains a blend of protein sources including turkey and chicken, and also adds in salmon oil and a mix of fruits and vegetables. There are no fillers or meat by-product listed among the ingredients, neither are there artificial ingredients of any sort. It’s a blend especially for adult dogs, and Wellness warns it is so palatable that your dog may try to eat more than its share. 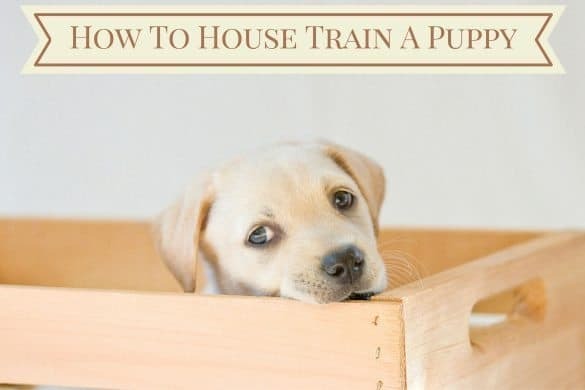 It is available in a range of sizes from 4 to 26 Pounds, which is great for the consumer; you can choose your size based on the size and quantity of dogs you’re feeding. The ingredients list a wide variety of nutrient sources, making this an apparently very healthy choice for your dog. Feeding this should provide a well-balanced diet suitable to a dog without any specific health or wellness issues. From the Simple line of dog food products, this formula lives up to its name, having noticeably fewer ingredients than many other Wellness offerings. This particular blend has just one source of protein, namely turkey. This may help for anyone trying to isolate an allergy, or simply eliminate red meat from the dog’s diet. The lack of gluten and grains of any kind should be of benefit to dogs with sensitive stomachs. Non-meat ingredients are also kept to a minimum; there are no berries or fruits, save for tomato pomace. There seem to more than enough supplements to make up for their absence, however. Owners may appreciate the variety of bag sizes, it being available in 4.5, 10.5, and 26 pound bags. It is marginally higher in calories than the CORE blend described above, but not enough to make weight gain a concern. The TruFood Blends are available in a variety of flavor profiles, and each one combines a dizzying array of readily identifiable ingredients. Dog owners who prefer a more natural approach to nutrition will appreciate seeing lentils, flaxseed, pumpkin, ginger and more listed on the side of the bag. Being able to choose from chicken, lamb and salmon-based formulas allow the chance to vary the diet, or find a favorite and stick with it. The line also includes wet foods and treats made in the same all-natural manner. Bag size is limited to either 3 pounds or 18 pounds, but this may be good enough for many people. 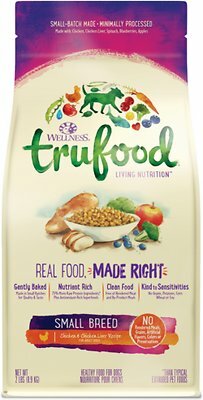 The kibble is baked, and Wellness touts that TruFood blends have 70% more raw protein than typical kibble. ​Looking specifically at the CORE line of dry kibble, this site has rated Wellness very highly. They endorse the list of major ingredients and consider this an above average dry dog food. They recommend the product without hesitation. ​This site has reviewed several Wellness product lines. Their overall feeling is that these are high-quality products, though they are concerned about the use of peas, flaxseed, and rye flour in certain formulas. They recommend both the CORE and Simple varieties. Wellness by Wellpet gives every indication of being a truly premium-grade dog food. The ingredients seem to be high quality (evidently they were once sued for using the term “human-grade” – and won!) ingredients that provide excellent nutrition. 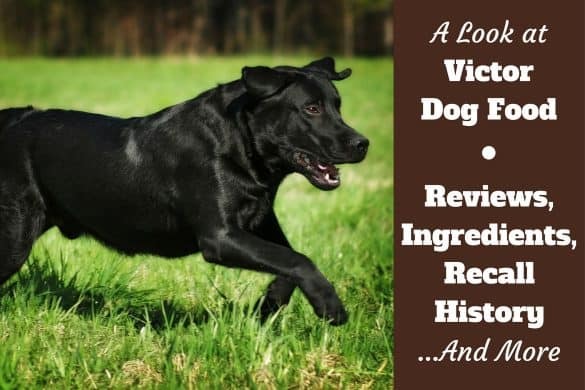 While certain dogs with highly specialized needs may not get what they require from Wellness, it seems safe to say that there is a blend to satisfy nearly every taste, body type, age and sensitivity. Looking at the company, Wellpet seems to do all the right things. They reacted with an extreme level of caution regarding both recalls with which they were involved, and respond to consumer questions and complaints on their website in a direct and concerned manner. As for us, we would not hesitate to recommend these products to virtually any dog owner. When buying, be sure to check for the formula that most suits your dog. In fact, you can even try the Product Selector tool they offer on their website for suggestions based on certain parameters you provide. Overall, this is a quality dog food worth trying. 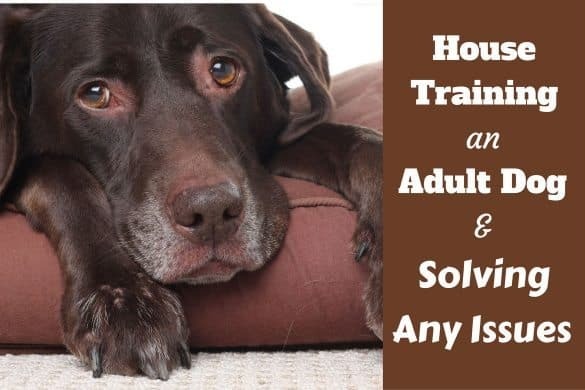 ​LabradorTrainingHQ.com assumes no responsibility or liability for the use or misuse of what’s written on this site. Please consult a professional before taking any course of action with any medical, health or behavioral related issue. Good review over the dog food. 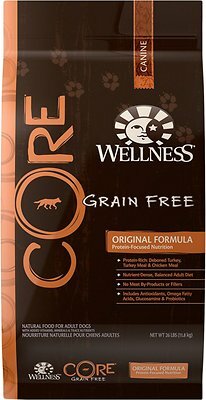 I am going to buy Wellness CORE Natural Grain Free Dry Dog Food for my dog as it is nutrient-rich. Thank you for such article! Its really good. Our 2 Chihuahuas loved the small cans of Wellness Venison and Sweet potato formula, however, Wellnes has discontinued it except in large 12 oz cans. The texture is thicker and different. They just won’t eat it. Does anyone know of anything similar that ight work? They loved the small cans and have eaten it for 5 years. Have you tried adding a bit of liquid to the food. As you have stated it is thicker in consistency.